Summary: The film generally, won’t linger in the memory as highpoints of Bond’s career. 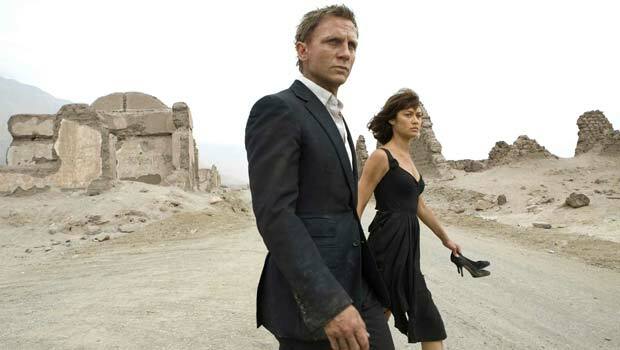 Like its hero, Quantum of Solace is clinically impressive but emotionally disengaging, resulting in a competent but uninspiring thriller. The first real sequel in the Bond franchise, the film commences a mere hour after Casino Royale concluded, with 007 pulling in the enigmatic Mr White (Jesper Christensen) for questioning. Daniel Craig’s Bond shows himself once again to be more psychologically complex than his predecessors – a tough, dedicated company man who unhesitatingly breaks heads for Queen and country, yet vulnerable enough to still be reeling from the death of Vesper Lynd, the only woman he’s truly loved. But he’s also far less fun, rejecting the vicarious high-life of international playboying he’s been so instrumental in defining. This brooding bruiser appears as uncomfortable as he’s ever done in a tuxedo. And when he drinks, he does so to numb the pain. Craig remains a charismatic physical presence but Quantum doesn’t allow him to flourish anything save for simmering rage and steely-eyed professionalism. The film flits between Italy, London, Haiti, Bolivia, Austria and Russia but there’s little exotic colour derived from any of these locations, which, in a plot that lacks coherence, starts to resemble an international courier’s itinerary rather than a secret agent mission. Though there’s plenty of promise in the collusion of the shadowy criminal cabal Quantum with both the US government and moles in the British secret service, and indeed, their chief manifestation in the evil, water-leeching machinations of Dominic Greene (The Diving Bell and the Butterfly’s Mathieu Amalric), it’s never properly developed. Apart from an all too brief appearance from Jeffrey Wright as the sympathetic CIA man Felix, turning Bond rogue against his masters at MI6 and the agenda-setting Americans only invites comparison to the Jason Bourne films, which retain an unpredictability of narrative that the formulaic 007 franchise can’t compete with. Feisty Bolivian-Russian beauty Camille (Olga Kurylenko), who matches Bond’s thirst for vengeance with her own personal vendetta is a compelling sidekick though and doesn’t spring into bed with him at the earliest opportunity. Instead, that honour falls to Strawberry Fields (Gemma Arterton), something of an anachronistic throwback to older Bond films who ends up suffering a similar fate to Shirley Eaton in Goldfinger. Judi Dench is once again superb as the tart M, berating her most effective weapon for consistently killing his quarry, yet remaining loyal to him despite pressure from her superiors. Amalric reveals a suitably villainous sneer, though his ultimate confrontation with Bond, a routine final sequence in a Bolivian military compound, is something of a physical mismatch. The action scenes are otherwise blisteringly edited and frenetic, director Marc Forster blowing Bond’s biggest ever budget on smashing up a succession of cars and a thrilling rooftop chase, though there’s nothing as inventive as Casino Royale’s parkour scramble and these sequences, as with the Jack White/Alicia Keys theme and the film generally, won’t linger in the memory as highpoints of Bond’s career.